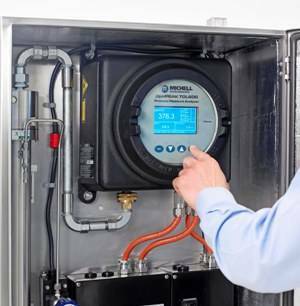 Michell Instruments has announced the launch of its latest moisture analyser for natural gas – the OptiPEAK TDL600. Using tuneable diode laser spectroscopy (TDLAS) technology, the analyser offers a class-leading accuracy with a lower detection limit of less than 1ppmV. While TDLAS technology has been used for some time to measure moisture in natural gas, the OptiPEAK TDL600 is the first of a new generation of analysers which overcomes the limitations of older models currently on the market. Because TDLAS moisture analysers measure the reaction of molecules to specific frequencies of light, changes in the background composition of the gas usually requires that the analyser is adjusted to maintain its accuracy. Scientists in Michell’s research department have developed the Dynamic Methane Compensation System (D-MET) to overcome this problem. With D-MET, the OptiPEAK TDL600 is able to measure moisture reliably in natural gas with varying compositions (such as blended gas from multiple fields or following bio-methane or re-gasified LNG injection) without the need for manual software correction factors to be made. With increasing statutory requirements in many regions for bio-methane to be added to gas distribution networks, the analyser already meets these new parameters. Taking advantage of the latest developments in laser spectroscopy, the OptiPEAK TDL600 has an unrivalled accuracy for any process moisture analyser of ±1% of the reading or 1ppmV. Its lower detection limit of 1ppmV makes it the most sensitive instrument in its class on the market, as well as being one of the most reliable. Michell has developed a laser lock system which automatically monitors the optical profile of the gas absorption peaks to ensure the laser remains locked to the correct water absorption signal, maintaining a high integrity measurement at all times. In existing TDLAS models on the market, laser drift results in a reduction of sensitivity. The OptiPEAK TDL600 provides a fast response because the optical measurement technology is non-contact. This means there are no wet-up or dry-down times – measurements can be made immediately. Plus none of the sensing components are subjected to the gas stream, protecting them from aggressive compounds and harmful contamination. Calibrated traceable to NPL (UK) and NIST (US), the analyser also has worldwide hazardous area certification, including ATEX, IECEx, cMETus, TC TR Ex. The OptiPEAK has also been designed for minimum cost of ownership. With an integrated sampling system and small footprint, it can easily be retro-fitted in to existing plant infrastructure. Due to the inherent stability of the instrument, regular field calibration is not required under normal operating conditions. The analyser will perform reliably for many years with just basic maintenance and housekeeping.